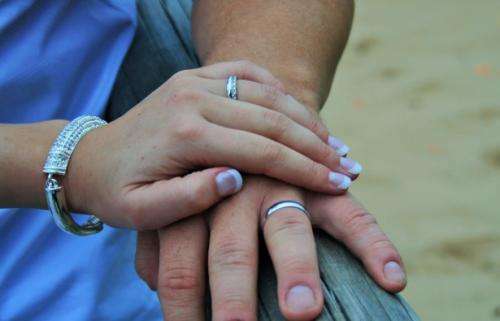 (Phys.org)—A study conducted by a team of researchers from the U.K., Tanzania and the U.S. has found an example of polygynous marriage that does not appear to be harmful to women or children. In their paper published in Proceedings of the National Academy of Sciences, the researchers outline their study of people living in villages in Tanzania, and why they believe organizations such as the UN need to modify their stance on the practice to better take account of cultural practices. Polygny is a term used to refer to marriage systems where males can have more than one wife, while polygamy refers to the actual practice of it. In this new study, the researchers looked into the question of whether a polygnynous marriage is in fact harmful to women or children as has been assumed by many in the international community. They looked at 3,500 households in villages in Tanzania, noting the occurrences of polygnynous marriage versus monogamous marriage and the standard of living for those women and children. In looking at their data, they found that first wives—women who were the first to marry a man with several wives, tended to have better nutrition as did their children, than women in monogamous marriages and their children. Later wives and their children fared on average as well as monogamous wives and their children, but not as well as first wives. This, the team claims, shows that not all instances of polygynous marriage are harmful to women or children—it shows that in some cases, it can actually be a practice that women can use to better their lives and that of their children. It is a matter of wealth and the rules that govern a society—if women cannot own land or other resources, for example, or take a job, as was the case in the Tanzanian villages, they will likely do better in life if they are able to attract and marry a man with some degree of wealth, which in some cases may mean, a man with multiple wives. This means, the team adds, that agencies such as the UN need to be more culturally sensitive when describing polygynous marriage and not just assume that it is bad for all women and children no matter what and use that argument to try to curtail the practice. Polygyny is cross-culturally common and a topic of considerable academic and policy interest, often deemed a harmful cultural practice serving the interests of men contrary to those of women and children. Supporting this view, large-scale studies of national African demographic surveys consistently demonstrate that poor child health outcomes are concentrated in polygynous households. Negative population-level associations between polygyny and well-being have also been reported, consistent with the hypothesis that modern transitions to socially imposed monogamy are driven by cultural group selection. We challenge the consensus view that polygyny is harmful, drawing on multilevel data from 56 ethnically diverse Tanzanian villages. We first demonstrate the vulnerability of aggregated data to confounding between ecological and individual determinants of health; while across villages polygyny is associated with poor child health and low food security, such relationships are absent or reversed within villages, particularly when children and fathers are coresident. We then provide data indicating that the costs of sharing a husband are offset by greater wealth (land and livestock) of polygynous households. These results are consistent with models of polygyny based on female choice. Finally, we show that village-level negative associations between polygyny prevalence, food security, and child health are fully accounted for by underlying differences in ecological vulnerability (rainfall) and socioeconomic marginalization (access to education). We highlight the need for improved, culturally sensitive measurement tools and appropriate scales of analysis in studies of polygyny and other purportedly harmful practices and discuss the relevance of our results to theoretical accounts of marriage and contemporary population policy. But hostility to polygamy is as much hostility to rules in a society that ensure "women cannot own land or other resources, for example, or take a job" or lack education that make it an advantageous choice for women. Cultural sensitivity surely is not respect for the human right of women to be the equal of men to own resources, get jobs and receive an education? What a wonderful study. Thanks to their bold efforts, villages around the world that allow polygyny yet are having doubts as to whether or not it is good for the women and children now know what to do: ban the women from owning property and working outside the home. Seriously, I can't believe that they were blind enough to claim that polygynous marriage can be good for women and children so long as they are being denied other basic rights. Invoking cultural sensitivity in defense of those who would deny people basic rights makes cultural sensitivity into something worthy of scorn. We're not talking about pottery skills or traditional dances, we're talking about people who have been denied some of their most basic rights. Polygamy actually refers to any marriage to more than one person, not the practice of polygyny. polygyny is specifically one man, many women. Polyandry is specifically one wife, many husbands. As far as this study, I would say polygamy is not even directly related to these cultures that don't let women own, It's probably a strong correlation, because that is the kind of culture that would allow more privileges to men than women, such as multiple wives vs multiple spouses. The same goes for polygyny in mormons - they allow the special privilege to men and not women, thus it would make sense that men have special privileges and power in that culture. take away that and you have an even mix of polygyny and polyandry - they are not even direct causes of each other. It's just a correlation and this study is pointless. The polygamy actually is unnatural, because there is almost equal number of men and women in the world. One woman is created for one man tо build a true family and to conclude true spiritual union. So they become one, as are complementary. From this union by love are born children to be raised in the family of man and woman. Normal family is extremely important for the spiritual education of children and the protection of the moral foundations of society. Such is the basic idea in the world in which we have two sexes. viko_mx has shown his true colours and STILL refuses to gain ANY education in Physics ! All this time he has proselyted by naive subtle attempts to push an anti-science agenda ! Why is his god so very silent & why does his god act exactly like an ugly punishing Devil over all ? viko_mx can only be inferred to be a Devil worshiper and should therefore be banned ! viko_mx I have asked you MANY times to explain WHY your god is a VERY bad communicator ? viko_mx, show HOW your god communicates ? I give you ONE more chance, explain WHY your god acts exactly as a Devil & is not trustworthy ? AND explain WHY Physics & relativity should NOT work with GPS, space-travel etc ? SO "it can actually be a practice that women can use to better their lives" - how nice for the guys to be told it's ok - you can have as many wives as you like - we think it's a good thing ! While the "civilized" world is trying to establish equality for all, in spite of the tendency of males to dominate if given half a chance. No, sorry, this may be ok from a purely theoretical paper perspective, and after all they are trying to justify their salaries, but I object to this on the basis of the ultimate perfect society we are all trying to achieve one day, no excuses for anything less than total fairness in all things, why settle for less ? The men with 5 wives don't need to be wealthy to create The "Lost Boys".